Diffusore dedicato al canale centrale, 3 vie, 4 driver. Diffusore per canale centrale da scaffale e da stand a 3 vie, 4 driver, tweeter a cupola S-PAL* da 25mm in allumino, voice coil da 25mm, midrange S-PAL* da 90mm in alluminio, due woofer da 140mm carbon-infused polypropylene, 92dB, 15-120W, 8ohms. Rome Wasn’t Built in A Day. Neither Was Monitor. We can’t promise it will still be around in two thousand years, but we can promise it will play louder, plumb deeper, look smarter and sound better than any other brand in its price range. Advanced S-Pal™ Satin-Anodized Pure-AluminumDomes with powerful neodymium magnets and ferro-fluid cooling for increased power handling! Highs are more soaring and spacious, crystal clear and undiluted even at the higher bandwidths. Baffled about Baffles? Don’t Be! For those of you who are wondering. 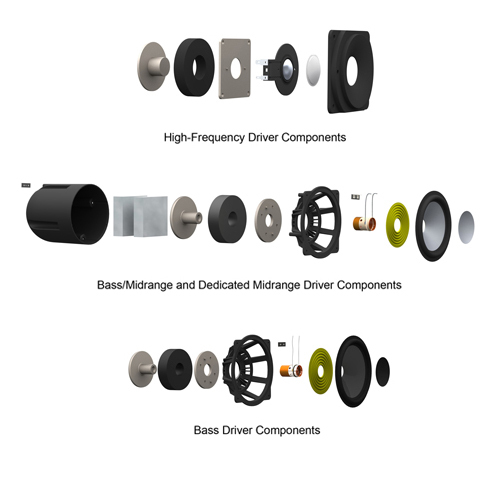 A baffle is the surface on which the speakers or drivers are mounted. It prevents the front and rear sound waves from interfering with each other causing sound cancellation, as well as to absorb sound energy, particularly problematic reflected sound. So a speaker baffle is pretty darn important. FEA-optimized (including a stress analysis) to overcome the limitations of the physical materials. A modal frequency analysis allowed us to deliver the most resonance-, vibration- and coloration-free Monitor Series cabinet to date! Rap on the baffle … you’ll hurt nothing but your knuckles! 7.25" × 17.75" × 10.5"
Paradigm Monitor Center 1. Cosa ne pensi? Lascia un commento!